Kindergarten-Grade 4 - This informative and appealing introduction to armadillos covers the growth and development of a mother and her four pups. One of the grown pups meanders northward and eventually starts her own family in Kansas. Beautiful watercolor illustrations (the hard carapace of the armadillo is very effectively rendered) accompany evocative imagery - "Her hind legs work like excavators catching the loose dirt and flinging it backward." There is some slight anthropomorphizing: "Her children watch and learn," and "she is Texas-born, but she has a traveling soul." The loss of a young pup to a predator is deftly handled: a picture of a burrow shows the mother armadillo resting with her remaining three pups. The landscapes show vibrant wide open spaces; one reveals the soft glow of a sunset, another shows a pond bottom, its soil disturbed by an armadillo walking underwater; it discloses the unusual ability of an armadillo to store air and submerge itself for "up to six minutes." Additional material about armadillos and a map showing their current range in the United States is included on the final two pages. This lovely book is packed with information, but it is more suitable for browsing or as a read-aloud than for reports. © Reed Business Information, a division of Reed Elsevier Inc. All rights reserved. In a burrow beneath a Texas field, an armadillo gives birth to four pups. As the little ones grow, they venture outside with her to hunt for food. She tries to protect them, but after losing one to a farm dog, she moves the rest to a more remote, woodland home. Eventually the largest one leaves and slowly travels to Oklahoma, where she finds a mate and bears four pups. The cycle begins again. 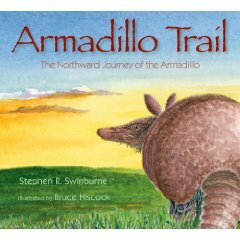 From the author and illustrator of Wings of Light (2006), this handsome picture book offers enough narrative to involve children, enough detail to engage them in understanding armadillos, and a refreshing lack of sensationalism and sentimentality about events in the animals' lives. Two pages of information and a range map are appended. The large, horizontal paintings show up well from a little distance, but reward close study too. Grades K-3.